Good Morning my loves!!!! I hope you guys had a great weekend. Mine was pretty awesome..met with clients and had fun night out with my sister and homefries. We were supposed to go the opening night of the Queens Night Market but our cousin was already there and said the lines were ccccccrazy so we ended up going out to eat and had a really fun time. I will definitely make it out to the market at some point though. 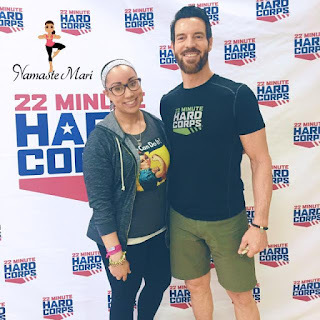 Last week I had the incredible opportunity to try out Tony Horton's new workout 22 Minute Hard Corp with Tony himself! His new program is intense but oh so fun. "22 MINUTE HARD CORPS takes you through a series of total-body rounds designed to maximize strength gains and fat loss within the 22-minute workout window. Each day, you'll alternate between functional resistance, cardio, and core-focused workouts. Your job...is to deliver every rep."
We did, burpees, various lunges, bear crawls, etc. and by the time we were done, I was drenched. I was lucky enough to get a copy of the program to take home and have done a couple the workouts and love it. The Cardio and Resistance routines only take 22 minutes each (core workout is 10 minutes) so you have zero excuses to get it done. I plan to incorporate these workouts into my schedule...I have been looking for a new challenge and this is exactly what I needed. This morning I did the Cold Start (warm up), Cardio 1, and Core 1 and burned a total of 333 calories in 45 minutes. If you are someone that is self motivated and doesn't need someone to keep them accountable; I highly recommended that this program. 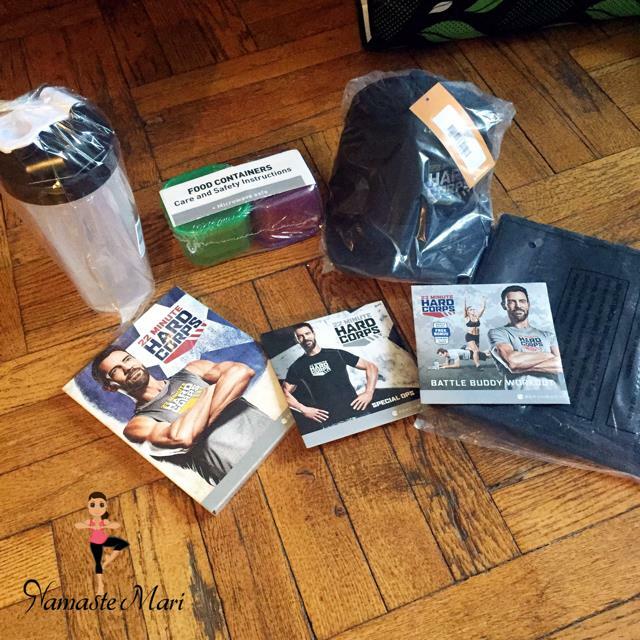 NM: You are a Cancer like me and usually cancers want to help people, is that what made you want to be a personal trainer? Tony: You know, I don’t know if it’s so much having been a Cancer but I am somebody that wants to make sure everybody is getting better. I love seeing people improve; I love seeing people find happiness and joy in the process. That was not how it was for me, I did standup comedy because it was scary and hard, I threw myself in that world just to see how scared I could be. NM: What made you go from being stand up comedienne and a gopher into personal training? Tony: I moved to California. I was a half-baked athlete in the East Coast in Connecticut and Rhode Island and I moved to California and gyms were everywhere and people were just working out all the time. It’s kind of socially where I used to hang out and so I really got thrown into it haphazardly. NM: I saw that you started by personal training an Executive at Fox. Tony: Yes, I was working out in the morning and he joined me and he got into great shape and he introduced me to Tom Petty. NM: I saw that you trained Bruce Springsteen as well. Tony: Yes, Bruce Springsteen, Tom Petty, Annie Lennox, Sean Connery, Usher, Ewan McGregor, the list goes on and on over the course of my career as a personal trainer; driving all over LA. NM: Have you ever thought of doing a Reality Show? Tony: You know I have and I have been pitched shows and to be honest with you they are a little bit too gimmicky for me. It’s too much about getting the shot, there is no reality about it, and everything is scripted. It’s all pieced together for ratings and money. If you give me a show where I get to be exactly what I want to be and do exactly what I want to do. Tony: (laughing and joking) I know…well aren’t I funny. I should have been a comedienne but that doesn’t pay any money at 2 o’clock in the morning in the middle of Pasadena. Yeah you know what, I have a pilot now it’s called the Board Room and we are shopping it around. It is hard man so we are going to do a go fund it thing and see if we can get it made. NM: Best piece of advice that anyone gave you? Tony: Don’t be attached to the outcome, enjoy the journey and stop judging. Those three are everything. NM: If someone could do one single workout every day what would you tell them to do? NM: Last question, what do you eat every day, like a go-to snack? Tony: My shake; frozen blueberries and strawberries, cashews, baby kale, whey protein powder, and a bunch of chia seeds and flax seeds.